Through nine games Baylor is standing tall with a 5-4 overall record with a 3-3 mark in Big 12 play. After a 2017 season where win number one came in game nine, a team that loses focus because it's feeling good about its accomplishments while becoming slightly satisfied with its progress is definitely possible. Sophomore quarterback Charlie Brewer told the media following Baylor's last-second victory over Oklahoma State that the thought of a bowl game would be poison to the team. Lane Kiffin didn't make an appearance in the locker room for a postgame speech, but his "rat poison" rant is definitely worth referencing. If this team truly isn't satisfied with the basic improvement, it's time to prove it. If not, this talk of "what's next" is nothing more than fluff at the weekly media session. "You’re happy about it, but I mean, there’s nothing it can really do for you," Baylor senior wide receiver Jalen Hurd said of the win over OSU. "Like, what does a win really do for you in the next week? Not really anything? What does a loss do? Nothing. "Just put your head down and grind like you’ve been doing. Just focus on your details and assignments." Make no mistake, the improvement has been a sight for sore eyes. A trip back to a bowl game in 2018 would fuel the Baylor fan base and prove to those wrong who believed the Green and Gold was back to being the cellar dweller they were in the decade-plus stretch beginning in the late 90s. Will a loss to nationally ranked Iowa State be a cause for concern? Absolutely not. A competitive game would continue to prove the progress, however. A victory? If that happens, national and regional talking heads will be talking about what could be considered the greatest turnaround in college football history from one season to the next after game No. 12. Chances are already slim, but are even smaller if focus is lost. "The biggest thing we’re focused on right now is not feeling happy about last week," Baylor senior offensive lineman Blake Blackmar said. "We’re pumped that it happened but it’s behind us. It’s what’s next now and that’s Iowa State. "Today’s practice, yesterday’s practice was all about focusing and dialing in on the small things so we can make sure we put the best product out on the field when we go up there." 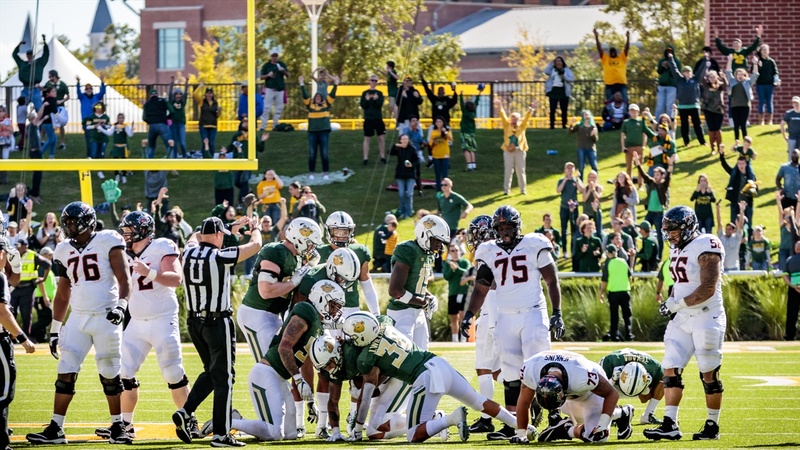 "It was transitioning towards that and then coming out of the bye week and getting our teeth kicked in by West Virginia..."
Matt Rhule knows his team needs to avoid the "poison" of being caught on the bigger picture rather than the task at hand. The second-year head coach said it's "great" that his team is saying the correct things, but now it's time for them to actually prove they are focused on the field. "We are the exact same team that went out and lost to West Virginia," Rhule said. "We played a better game, but the mistakes were still all over the field, so if we start thinking about December and January, we are going to come out and get punched in the face. I think we must stay focused on what is next." Baylor sophomore defensive lineman James Lynch told the media that reaching a bowl game would be ideal to send the seniors out on a positive note. Blackmar wouldn't disagree, but if the team doesn't catch the lesson they missed after the Texas game this time around, the high of getting win No. 5 was all for nothing. "It was transitioning towards that, and then coming out of the bye week and getting our teeth kicked in by West Virginia, (the loss) really opened eyes up to it’s not just something you say, it’s something you have to do," Blackmar said. "If you sit there and think about the UT game and feel good about that and then go get your teeth kicked in, and then feel bad about yourself after you got beat by West Virginia like that, we don’t come back and play like we did against Oklahoma State." The same team that took the field in Norman and Morgantown was the same team that took the field in Waco against Oklahoma State on Saturday. The environment changes, but the game of football will always stay the same. “After you win or lose the truth is always in there," Rhule said. "We try to handle them all the same and we go back and watch the film and see what we can do better. Eventually you hope that the players buy in to that and they don’t want to just feel happy, but they want to become elite and be the best version on themselves." tiny man, not a bad look. Might get beat but there will not be any teeth kicked in. There's not a lot of teeth left to be kicked in after this past month. Sucking on the road far worse than at home is a huge issue. I agree. I think we keep it close, as long as our Texas boys don't puss out because of a little chilly weather. It was posted on premium but this is the first time since the 70s all of our road game opponents will have been ranked when we play them. This is another reason we need to bring BUGWB to all Big XII games, not just the home games. Yes, I'm sure that the West Virginia game would have played out much differently if only our players would have heard the BUGWB over the deafening roar of WVU fans. Lol.